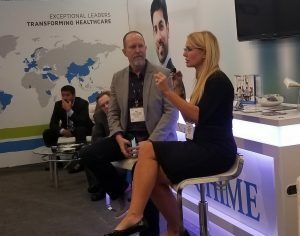 Sarah Richardson, CA Market CIO, DaVita Medical Group, and Drex DeFord, Digital Health Leader, gave an engaging talk on behalf of CHIME Technologies, Inc. at HIMSS18 in the CHIME booth. Richardson and DeFord are both faculty members of the CHIME Tech Speakers Bureau. CHIME Tech Speakers Bureau connects companies throughout the CHIME Foundation and beyond with talented, thought-provoking speakers for presentations at company meetings, webinars or internal training sessions on the buying cycle and selling and marketing to CIOs, along with a number of other industry topics. Both speakers highlighted the importance of participating in organizations like CHIME and HIMSS. “I want to elaborate on the relationship with CHIME and with HIMSS. For me, that is where I learn about all my [partner firms], all the things I need to do, and all the connections I need to make.” Richardson said. 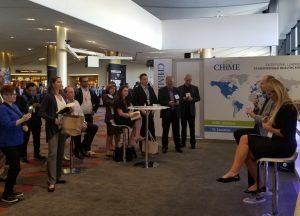 “If you want to get to us, if you want to have conversations with us, the best way is by being there [at CHIME/HIMSS] all the time, and not always being in [closing] mode. We get to see you, we get to know you, we’re involved with you on committees. We get to see how you work, what you do, and how you deliver. And all of that ends up turning into a relationship. Once I have a relationship with you, that builds trust, and that really is the bottom line on what you should do.” DeFord said. On the subject of gift giving, DeFord and Richardson offered suggestions for avoiding compliance issues. “If you feel compelled to give a gift, give it to our foundations,” DeFord said. Richardson suggested following the limit of $50 for a gift, unless it is a shareable item for her team.